Penguins International is a non-profit organization committed to preserving and protecting penguins throughout the world. To accomplish our mission, we actively engage in penguin conservation, promote penguin awareness and conduct scientific research investigations; three activities that go hand-in-hand to fully understand these amazing species of birds and protect them for all to cherish. Our current conservation work is focused on population trends. 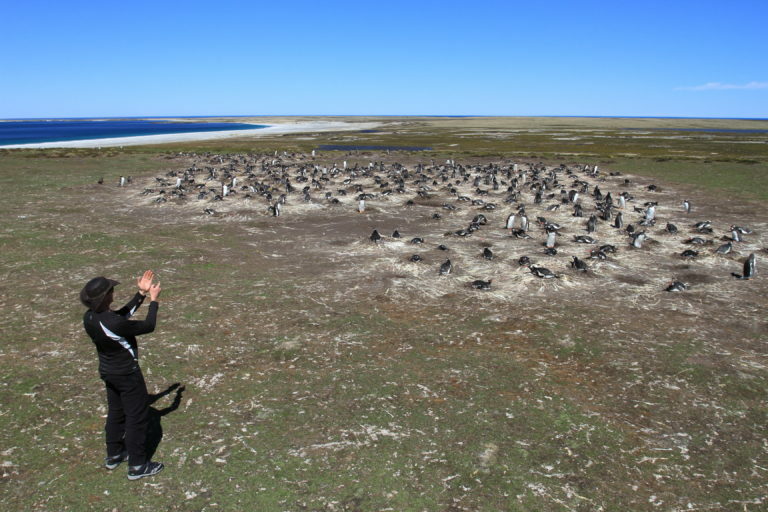 We are actively monitoring penguin colonies in regard to census changes, physical size and geographical movement as well as Geographic Information System (GIS) mapping of colony boundaries and access. This detailed population data will help us understand the current state of penguin health. Penguin conservation is important not only for the sake of the animals, but also for the outlook of our planet. We all love the cute, charismatic nature of penguins, their human-like qualities, and their stunning underwater acrobatics. We also want penguins to be around for millennia to come, so they can be enjoyed by many future generations. And we certainly don’t want human activities to be the cause of their demise. But penguins are far more than the beautiful, amazing creatures they appear. They are sentinels of the health of our oceans and our planet as a whole. Like their relatives, the proverbial canary in a coal mine, that was the first to succumb to a toxic environment and serve as a warning to the working miners, penguins serve as a similar type of sentinel. Because penguins feed high on the food chain and accumulate toxins that build up in the ocean, if penguins start dying off, the health of humans is also in grave danger. Most penguins live in regions of the planet that are far from any industrialization, and if these penguins become affected by such dangers as warming of the planet, contaminant accumulation, or over-population, humans are also in imminent danger. But we can make a difference before it’s too late. If we can protect the penguins, we can protect the planet. Please help us in spreading the word about the importance of penguins to our planet. They need your help! Pollution contaminants such as mercury and Persistent Organic Pollutants have increased since the beginning of the Industrial Revolution and are now becoming more prevalent in isolated regions of the planet. These pollutants are stored in fat cells therefore have bioaccumulating properties which are readily quantified in high-trophic predators, such as penguins. Additionally, penguins serve as unique biomonitors for this contaminant exposure because they are relatively sedentary compared to flying birds. They also have a very limited migratory range during the non-breeding season. These characteristics make penguins excellent biomonitors for environmental contaminants throughout the region. 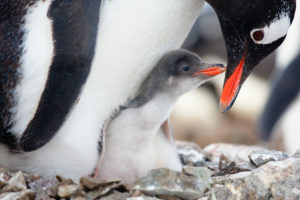 Our current study is comparing contaminant loads in Gentoo penguins from the Falkland Islands, South Georgia Island and the Antarctic Peninsula to analyze the spread of these contaminants in these remote regions. This study focuses on colonization of penguins by antibiotic-resistant bacteria to determine if antibiotics are reaching these isolated regions of the planet and stimulating mutations of antibiotic resistance in bacteria. Pharmaceutical antibiotics aggregate in wastewater systems throughout the world following elimination in urine and these antibiotics eventually discharge into oceans. Antibiotic-resistant strains of colonizing bacteria have been found on various marine fauna close to populated areas. We are investigating whether antibiotic levels in penguins are reaching high enough levels in the sub-Antarctic and Antarctic regions to initiate resistance in these isolated areas. Penguin lover, scientist and cold-weather enthusiast. Six seasons with the penguins and counting. Spent 10 seasons working alongside penguins in Antarctica. Has visited both the northernmost and southernmost Denny’s in the world. Passion for the outdoors, sports, and travel. Visited Antarctica to complete all continents and see penguins first-hand. Enjoys combining his passion for birds and conservation in his blog to help educate the general public about issues penguins are facing around the world. Nataly H. Aranzamendi Ornithologist with a PhD in Behavioral Ecology from Monash University, Australia.